These are the penultimate unit painted in my Lion Rampant retinue - men at arms, plastics by Perry Miniatures of course. It's quite hard to make a basically silver unit look interesting, the heraldry on the flag and surcoat were my attempt here, though as usual I feel my freehand lets me down a little. The lowlier troops in the background are far more visually appealing, but I will be unable to show them for a couple more weeks due to them being entered in the Lead Adventure Forum painting league. In terms of gaming, I have had another couple of sessions since my first efforts. Lion Rampant continues to puzzle and impress at the same time. The mechanics are very nice and easy, combat is simple to perform and there is no "fiddling about" that seems to plague many a ruleset. The morale system is particularly well done too - as casualties build in the unit, it's more likely that the troops will lose their nerve and leg it! The frustration comes in the activation system and the scenarios. A few games have been won and lost in the first couple of turns of the game - a failed activation roll at the start of the game can be very difficult to recover from. I hope to get more games under my belt, see if a solution presents itself. 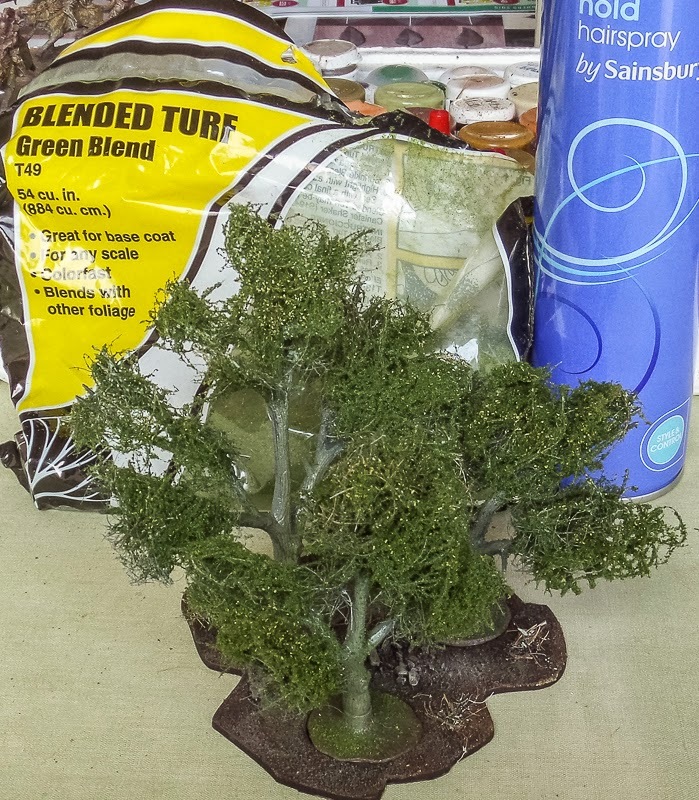 I have been looking for some reasonably priced grass tufts for a while. There are plenty around to choose from, but some of them are extremely hard on the wallet. A tiny patch of static grass for five pounds?!? - no thanks. 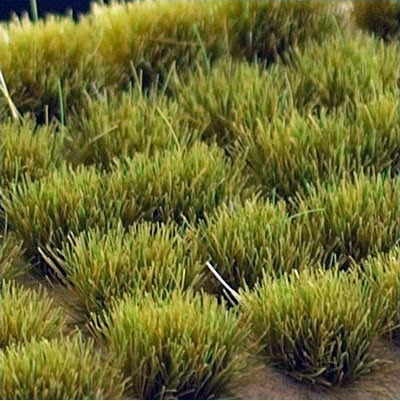 But recently I stumbled across Gamers' Grass by Great Escape Games. They are available in a variety of sizes and colours - here's the product page on their website. Suitably impressed by the range and the affordability, I put in an order for five different strips on Tuesday and my little parcel arrived on Thursday. Grass on speed! That's excellent service. 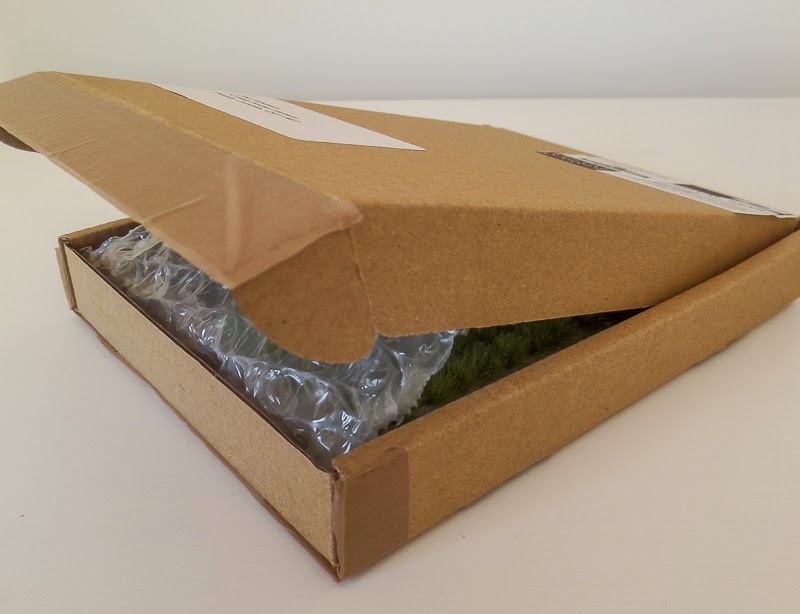 The tufts were sent in a small but strong carton and arrived in good shape. Each strip of paper is about 15 x 5 cm and holds a variable number of tufts, depending on which size you opted for. 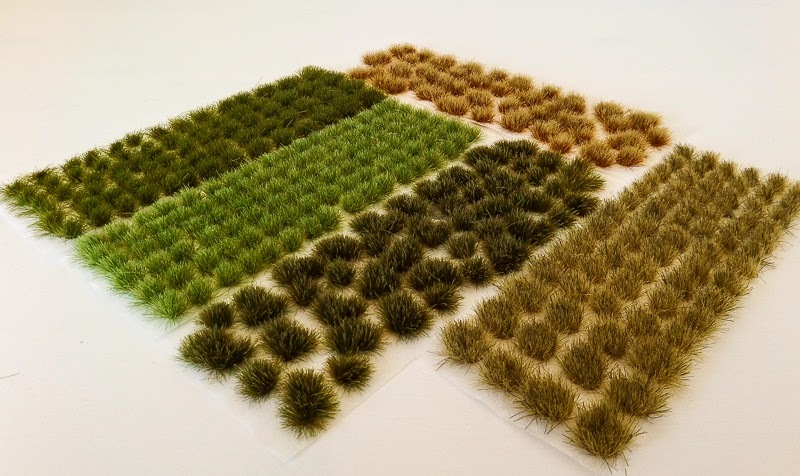 The wild grass option gives you fewer, larger more varied clumps. There's a nice variety of colours here, they cover all the seasons I would say, so you should be able to pick up the right tone for your basing scheme. The tufts are self-adhesive. I just used fingers to pull them off and press them on to the bases. I have used them on a few different test bases, along with other basing materials, just to gain an idea of how they could look. You don't need many to add a little extra something to your figures. Smaller scale figures, such as the Perry historical and Lord of the Rings figures, probably need the smaller tufts. The larger tufts could be used on the more heroic scale of standard fantasy figures, or maybe on terrain projects. My test batch of five strips cost me £11 including UK postage. I have enough here to base several skirmish forces I would think, so I am a happy customer. Thoroughly recommended. Fantasy wargames obviously share much of their genetics with buses - you wait ages for one to come along, then two arrive together! 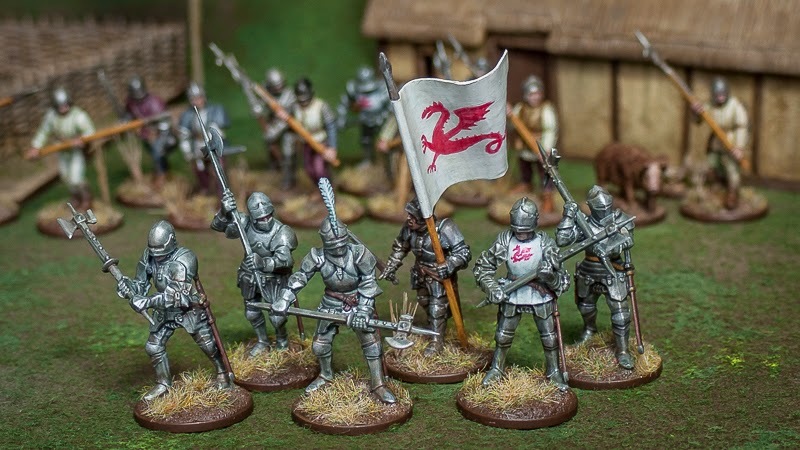 After yesterday's announcement about a fantasy faction for the Saga game, up pops this news - there's to be a fantasy version of Lion Rampant. Here's the announcement on the author's blog. 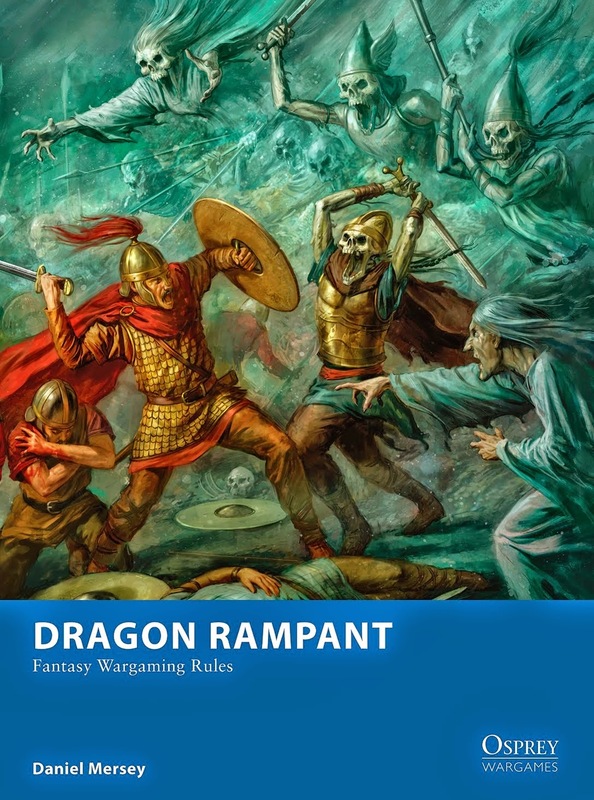 This is a much bigger deal I would say, a complete fantasy system using the Lion Rampant mechanics, with rules covering monsters, magic, flyers and the rest. It seems I have absolutely no excuse now, I must complete those half-painted Lord of the Rings factions. Just when I thought I had kicked the fantasy habit. The timing could hardly be better for me. 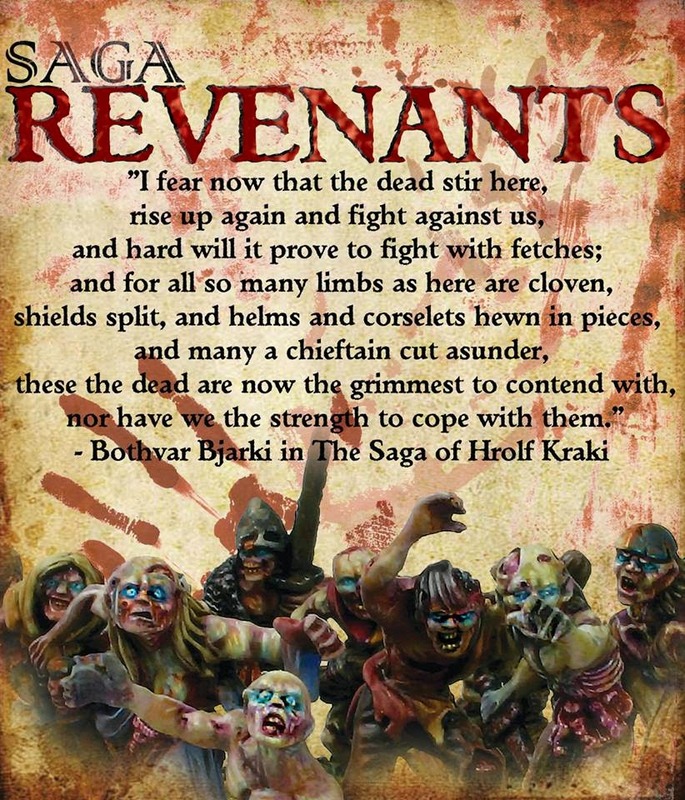 Having pledged on the Blood Rage game purely for the miniatures, I was anticipating looking around for a system to use them in, maybe even having a dabble at some home-baked rules (I still might). But now I can just use them in this system. Along with Of Gods and Mortals, and the Saga mods, it seems I now have three systems to try. Happy Days. For a good while I have been wondering about playing fantasy factions in Saga. There are Lord of the Rings battle boards on the web, many of them simply the historical boards with renamed abilities. The vikings' aggressive style is taken up by the forces of Isengard, the Normans' love of cavalry and archery is extended to Rohan, that kind of thing. I have yet to try it, as I am still a little bit short of painted troops, but it's at the top of my to do list. It should also be possible to field just about any fantasy army you can think of. With a little imagination there's a battle board for all my Warhammer forces, I just have to sit down and come up with one. Men, dwarfs and elves are probably the easiest, but things like daemons and undead are perhaps a bit more difficult. But now, there's a little help on the way, from the publishers of the Saga game. On release at Salute, a new battle board and complete faction, for Saga games with a fantasy twist. Full details on the gripping beast site. The rules and battle board will be available for download after the exclusive set has sold out, so that should help with how to field psychological horrors. I am pleasantly surprised by this little snippet of news. I have been playing a fair number of skirmish games recently, last night it was a return to Saga. Having played all the official scenarios several times over, I made up a quick and easy one of my own. Viking raiders had to penetrate the Anglo Dane defences and torch the village (they probably looted a few items too if they had any sense). 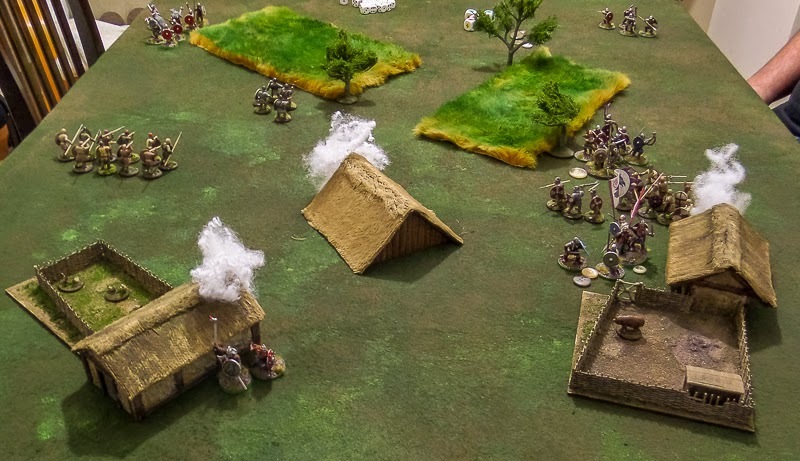 It was a very simple affair, any unit by a hut and not in combat could attempt to burn it by activating and rolling a 4+. After fierce fighting, a pair of hirdmen (bottom left) managed to break through the defences and in the very last turn set the remaining two hovels alight. The whole village up in smoke! Victory to the vikings. The game also gave me a chance to try out my new terrain. I still need to make up some boundaries (hedges or walls) and I think my battle mat needs some roads or muddy areas marked on it, to break up the expanses of green meadow land. Skirmish gaming is my thing at the moment, I am bouncing from Saga to Lion Rampant to Dux Britanniarum and back again. At some point I should write a comparison of the different systems. It seems very fitting to be posting this today. Outside there are signs that spring has arrived - the sun has finally made an appearance and the temperature has climbed into double figures. Green shoots are everywhere, including in my terrain collection. After the partial success of my trees made from garden waste, I wanted something that was more sturdy but not too expensive. You might remember that I recently picked up some tree armatures from a hobby shop. I also bought some rubberised horsehair (from ebay, the hobby shop did not stock this item). With my collection of turf and foliage that I usually use on bases, it was time to get started. After googling countless model train sites for instruction, I stuck the horsehair to the branches using pva glue and then, when fully dry, trimmed off the most straggly bits. Then I sprayed the trunks with a grey primer and applied some very quick and basic drybrushing. Finally, I used a cheap extra firm hold hairspray (from the local supermarket) to fix the foliage on to the armatures. Simply spray, sprinkle, spray, sprinkle, until you are happy with the effect. A final trim of any straggly horsehair and it's job done. 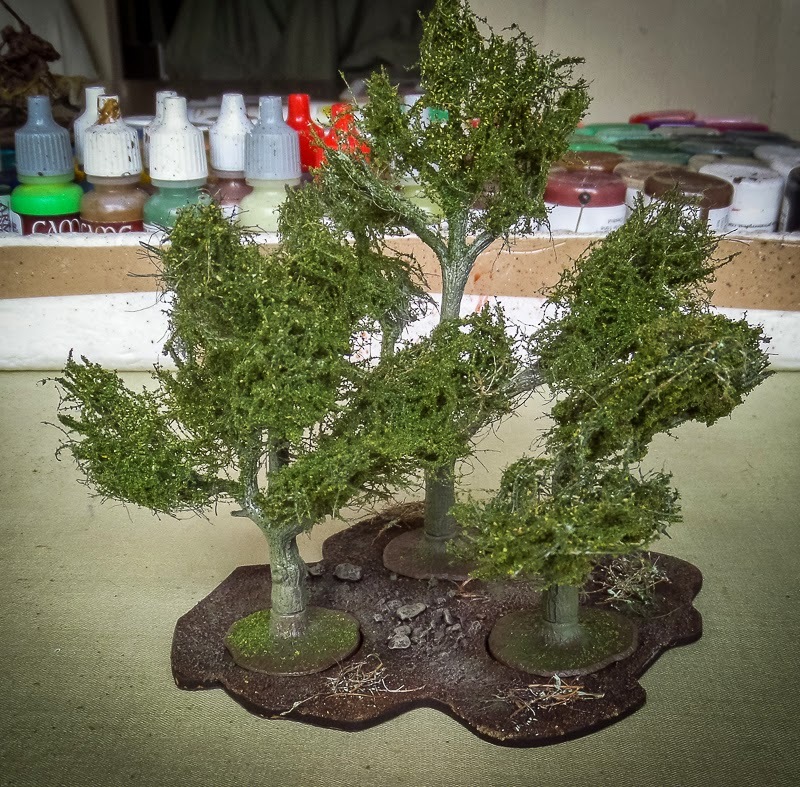 This test batch of three trees costs around a pound in materials, and about half an hour of hobby time to make, and I think the results are reasonable for that investment. They are a bit flat, I need to work out how to get the horsehair "plumped up" when I stick it to the branches, but I am quite happy with this first attempt.